The author, who teaches Scripture at Salve Regina University, chooses 12 women, including two sets of sisters. The number 12 is not accidental, being the number of the tribes of Israel and of Jesus’ apostles. 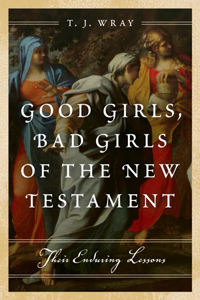 Wray introduces her study of the women with an overview of the role of women in the period in which the New Testament was written. She notes that Jewish society of the period, like that of the societies surrounding it, was essentially patriarchal, with women having roles in the home but not the public arena. This underscores the openness of Jesus to women as key members of his own community. Wray carefully describes the passages in which the chosen women are featured, blending biblical scholarship and thoughtful commentary. She concludes each chapter with lessons that may be learned from biblical narratives and the actions of the women. Part I deals with “Sisters, Sinners and Supporters.” These are the sisters Martha and Mary of Bethany; the granddaughters of Herod the Great, Bernice and Drusilla; the adulterous woman in John’s Gospel; the woman with the 12-year hemorrhage; Mary Magdalene; and Tabitha, the benefactor of Jesus. Part II — “Mothers, Murderers and Missionaries” — takes up Elizabeth, the mother of John the Baptist; Mary of Nazareth; Herodias, who was responsible for the murder of John the Baptist; Pilate’s wife; Prisca; and the woman at the well. She concludes with an overview of scholarly opinion and lessons for today. The book would make an excellent text for a parish or ecumenical discussion group. While I highly recommend this book, it is not without its flaws. The author is not entirely conversant with first-century Judaism as it was evolving into rabbinic Judaism especially after the year 70 C.E. (the Common Era) and the destruction of the Temple of Jerusalem, which was a key event in the development of both Judaism and early Christianity. She tends to place too stark an either/or contrast between the Jesus movement and the contemporary, also evolving, Judaism of the time in which the New Testament was written, seldom taking into account the specific historical and geographical context within which and for which the New Testament authors wrote. With regard to the former, she states that ritual impurity would have been seen as a sign of sinfulness, of divine punishment. That is wrong. Ritual impurity had nothing to do with sin. For example, cleansing and preparing the dead for burial makes one ritually unclean and requires a “mikvah,” or ritual bath. But preparing the deceased for burial is considered a good deed, a fulfillment of biblical law, hardly a sign of sin. Also, both the Jesus movement and contemporary Judaism looked for a Messianic end time in which all humans will rise from the dead, be judged by God, and an ensuing age of universal peace and justice, an idea that she erroneously states was not a Jewish one. Fisher is a distinguished professor of theology at St. Leo University in Florida. p25 refers: Too discribe Mary of Bethany as being a sinner is NOT erronious.